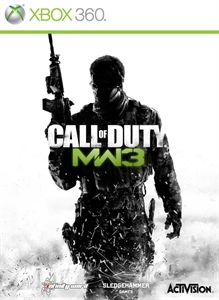 With its third DLC Collection, Modern Warfare® 3 drops a combat-heavy care package of Special Ops Chaos mode, 4 new Special Ops missions, and 3 FACE OFF maps for the ultimate trifecta in solo and co-op gameplay. High-altitude Special Ops challenges put tactical skills to the test, with players navigating armed drones above a Russian destroyer and evading RPGs from the roof of a helicopter-swarmed hotel. Upping the ante further, FACE OFF firefights pit players head-to-head on a six-lane stretch of desert highway, at an abandoned crossroads near a New York overpass, and near the path of a violent tornado. A whole new way to play Call of Duty®, Special Ops Chaos mode delivers the ultimate in arcade mayhem. Experience truly heart-pounding and adrenaline-fueled action while competing for high scores in Resistance, Village, Underground and Dome. Chain kills together against a never-ending onslaught of enemies to increase your combo multiplier and earn performance enhancing perks. Choose your route through each map to optimize weapon pickups, attack, and escape options. Play solo, split screen or online with a friend to take out as many enemies as possible before they take you down or the clock hits zero.